As a self-publisher who uses Print On Demand, and a media glutton, my appetite for books about publishing may have no limit. 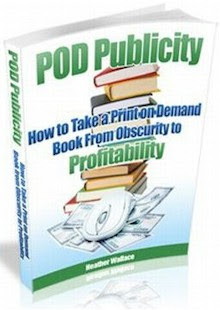 I've recently been bombarded with almost daily email links that promote POD Publicity -- How to Take a Print on Demand Book from Obscurity to Profitability. Since this book seems to be having great exposure itself, I thought its author Heather Wallace might be able to teach me a few things. If I liked the book, I would even have given it a good review on this blog. Strangely this book about POD publicity, that has good publicity, is not a POD book. In fact it's not even a physical book unless I'm willing to expend time, toner and paper to print my own copy. The normal-looking perfect-bound book shown on the publisher's website won't exist unless a reader decides to have it POD-ed. The picture of the book is just a picture, an optical illusion, not reality. (1) $29 ("Value Priced at Only") is more than I pay for most books, but I'd pay $29 for an important book. People pay $29.95 for a book I wrote. HOWEVER, for $29 I expect a real bound book that I can read anywhere, not a file downloaded to my PC. For $29 I want to be just a reader, not an unpaid employee who's the last part of Heather's book publishing process. I want pages glued into a cover, not just a data stream. (2) When I buy books, I expect to either order online at Amazon for next-day or two-day delivery, or to drive five minutes to B&N. Sometimes I make an accidental discovery at Costco or Sam's Club or an airport book shop and buy then and there. A five-minute download may be the right delivery for some people in some situations, but it's not what I want in this situation. I want a physical book, about the same size as the other books on the shelf behind me. I don't want to have to use this PC to read a book, or have to punch holes in 8.5 x 11-inch pages and flip through a looseleaf notebook to read them. Publishers should make books available through the sales channels and in the formats that readers want to use. Heather's website points out "two special bonuses" book buyers receive for the $29 payment. The first bonus is a 15-minute coaching session conducted via either email or chat. Heather says, "Those fifteen minutes themselves are worth more than the price of this book, but they are being offered to you absolutely free for a limited time." Since a customer would be paying $29 for a book that exists only in cyberspace and costs Heather nothing to produce, store or ship, it might be more accurate for her to state that she charges $116 for an hour of coaching, but if you pay for 15 minutes, she'll give you a free download. The second bonus is "Example Messages Guaranteed to Get Results" when "writing to ask for publicity." Since "these messages have been peppered throughout the pages" of the book, I don't see how they can be considered a bonus any more than any other words you are paying for. I also doubt that they can be guaranteed to work. There's nothing wrong with ebooks, but they should not be the only format offered to a reader. I already own books, music and movies in multiple formats. I would have paid $29 for a physical book plus a download, but I won't pay $29 for a mere stream of bytes from Heather's hard drive to mine unless my life depends on it. Publishers who want to have more sales, should offer more choices. It seems both ironic -- and stupid -- that a book about PRINT on demand, is not sold as a printed book, even if readers "demand" it. The fact that this book is about POD and doesn't use POD is both ironic and suspect. How can you trust the author to know about POD, when she hasn't invested the minimal effort to make her own book POD? Well Michael, my book IS POD and It's available most anywhere you want to order it. Getting it to come out of obscurity, however, has been very difficult, hence it's non-appearance on any bookshelves. Perhaps you'd be willing to review it here. I'd certainly be willing to send you a copy. KING BY RIGHT OF BLOOD AND MIGHT. A young adult fiction of about medium length.